One day while going through nutrition book and while surfing the net, I was surprised to see lack of blogging and articles on one body part that is the eye. Since my childhood I have noticed that we take our eyes for granted. Just because you are seeing well and have no irritation, one does not think it is necessary to go in for an eye examination till a problem arises. Well! It can be too late! Do you know your vision keeps getting worse as you age? While in School almost 70 % of us have faced blurred vision not able to read the blackboard clearly. Also most of us have spent out childhood sitting close to the television, rubbing eyes and these problems still persist and we still neglect them most of the times. You neglect it till it gets worse and then get spectacles without which you can see at all. Healthy vision should be of priority since childhood. The challenge begins from viewing the black board, ability to see clearly on a computer. If neglected the same persists in adulthood. Modern day computing and internet means spending more time with your smartphone and computer screen. Two hours with computer means tired, strained feeling such as eyestrain, redness, irritation, dryness, burning, blurred vision, headaches and neck and shoulder pain. 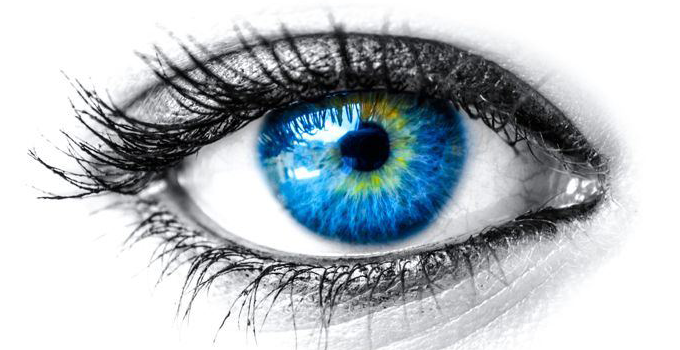 A healthy eye is an indicator of good health. It is important to maintain healthy weight for healthy eye, being overweight or obese increases the risk of diabetes, high blood pressure, cardiovascular diseases, each of these damage vessels in eye and lead to vision loss in an individual. There is a strong correlation between eyes and diseases. Diabetes is one of the leading causes for blindness among individuals in many countries especially in the age group of 20 – 74. Therefore, it is important for everyone who has diabetes to check their eyes regularly. High blood pressure and high cholesterol levels lead to cataracts (clouding of eye with proteins and glaucoma). The shocking thing is you may not realize that you are suffering from a disease or you have diabetes mellitus until you experience loss of vision. Therefore I would say why wait till a problem arises? Dietary intake prevention and lifestyle modification plays important role in healthy vision. Free radicals bring about oxidation which is the evil for good vision as it destroys epithelial layer in eye & deeper ones of the cornea. Antioxidants( vitamin A,C,E, lutein ,zeaxanthin & zinc) present in fruits and vegetables help fighting against these free radicals which minimize the damage to your cells. Citrus fruits are powerful topmost antioxidants such as vitamin C, retinas of our eye require vitamin c to maintain proper nerve cell function. Vitamin C with essential nutrients slows AMD. Grapes, strawberries, papaya, orange, green peppers, Peaches, blueberries, mango, tomato, apricot & cabbage all provide Vitamin C.
Vitamin E works along with vitamin C. It is a Powerful antioxidant in nuts, cereals, wheat germ, sunflower seeds and sweet potatoes. It Protects retina from damage caused by smoking and alcohol. Yellow orange coloured fruits and vegetables like Oranges, lettuce, bell peppers, tuna, mango, kiwis, grapefruits, dried apricots, tomatoes, peppers & raw carrots contain good amount of vitamin A.
Salmon, Tuna, flaxseed, walnuts, canola oil, soyabeans for visual function and retina development. Essential helper molecule as it brings the vitamin A from liver to the retina to produce melanin that protects eyes. Nuts, legumes, Oyester, turkey and crab are rich in zinc. Green leafy vegetables like spinach and kale contains Lutein and Zeaxanthin which absorb the damaging light, help retina cells off free radicals and reduce risk of macular degeneration. Eggs yellow peppers mango, kale, spinach, broccoli, green peas , sprouts. We all know that in this fast moving World we can’t avoid computers and smartphones but in order to keep your eyes healthy give your eyes a break from the computer screen every 20 mins or more for atleast 30 secondss. Make sure your lens has not expired, blink your eyes more to avoid dryness. Quit smoking as it increases risk of cataracts. Protect eyes from sun, ultraviolet rays by wearing right kind of sun glasses. Remove eye makeup using coconut oil. Use proper lighting to avoid eyestrain. Relax your eyes by doing some eye exercises like rubbing your palm and keeping it on your eye. We eat the right food to slim down and get into shape, but eyes are the mirror of a human soul and they are most important for a healthy life. Manisha Guram is a keen learner of healthcare and research and that explains her Masters degree in Biochemistry from KEM Hospital. She also has a diploma through UGC sponsorship in food science and quality control from Ruia collage and was awarded the Dr. K. U. NARAM NATIONAL AWARD in the final year of her diploma. She has worked in the past with Breach candy hospital where she researched on the importance of Delta Bilirubin in Liver Disorders. She has also interned with Parle products and Worli Dairy. Given her keen interest in technology she trained to get a certification in web designing. She likes the combination of technology and health and that's one reason she chose to be a part of GOQii. A state level carrom player, she has also won medals in Mumbai Arts and at District levels. She is currently getting trained at Shaimak Davar's institute for dancing and her mantra for staying fit is “smile and enjoy each step of life along the way”. She also loves helping people and is engaged with the Art of living. She is passionate about reading inspirational and motivating novels.